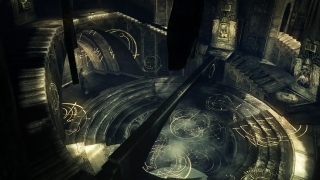 The Nexus is a hidden temple that "binds together the northern land of Boletaria." It binds the souls of all would-be demon soul hunters so they cannot leave; they can only travel to the 5 worlds connected by the archstones. This is your place of retreat and refuge, which contains a variety of NPCs and vendors to aid you in your journey. The Nexus contains the Archstones, which allow a character to travel to the 5 worlds overtaken by the fog and demons. There is a sixth Archstone which appears shattered and unusable. At the highest point reachable by the stairs, there is a door which leads to the Pantheon, which is the visual high-scores display. You can examine the stats and appearance of top online players, and your own 4 characters at the last time they "United the World" (beat the game). Once you have defeated three Archdemons (the very last boss demon of a given world), the normal background track becomes an organ track. If you attack any of the vendors or NPCs in the Nexus by accident, immediately quit to the in-game menu. Doing so may prevent them from permanently attacking you whenever you draw near. This can be a game breaking experience, as some NPCs like Stockpile Thomas are vital for smooth gameplay. Merely reloading your game or letting them kill you will not rectify their hostility; they will stay aggressive until you either kill them or progress to the next playthrough. Note that this does not apply to The Maiden in Black, who will merely revive herself after being killed and not commence any hostilities towards you. If you ever feel the need to suicide, the fastest way in the Nexus is to climb up the first set of curved stairs. You should be immediately above Patches, the Hyena. 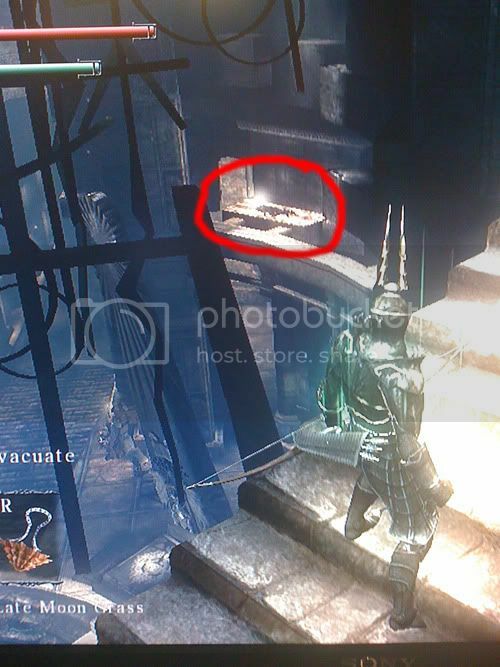 If you sprint or roll off this ledge so that you land on the central transparent seal, you should die. Make sure you don't land on Patches and hurt him, as this could turn him aggressive towards you. Once pure black character tendency is achieved, Mephistopheles will show up on the second floor of the Nexus after Yurt is killed. To obtain all items from Mephistopheles, all Nexus inhabitants must still be alive except for Yurt. Once pure white character tendency is achieved, speak to The Monumental to receive the Friend's Ring. This will only happen if you answered "Yes" when he asks of you to "accept the mission" during your initial conversation with him. Note that if you missed this chance, the opportunity will not present itself again until the next playthrough. Follow the balcony onward past the Monumental, take the narrow staircase down to the lower level, and search left to find a Stone of Ephemeral Eyes. If you enter the Pantheon, search the inner ring on the far left side. You will find a Stone of Ephemeral Eyes. On a broken ledge high above Blacksmith Boldwin, there is a body with 2 New Moon Grass. To reach it, you must jump down from the curved staircase high above, and then walk from the other end of the ledge to reach the corpse. Symmetrically opposite of the above corpse on the ledge is a Renowned Soldier's Soul. Access it the same way, but from the opposite stairs.